Welcome to part 3 on our garage organisation. 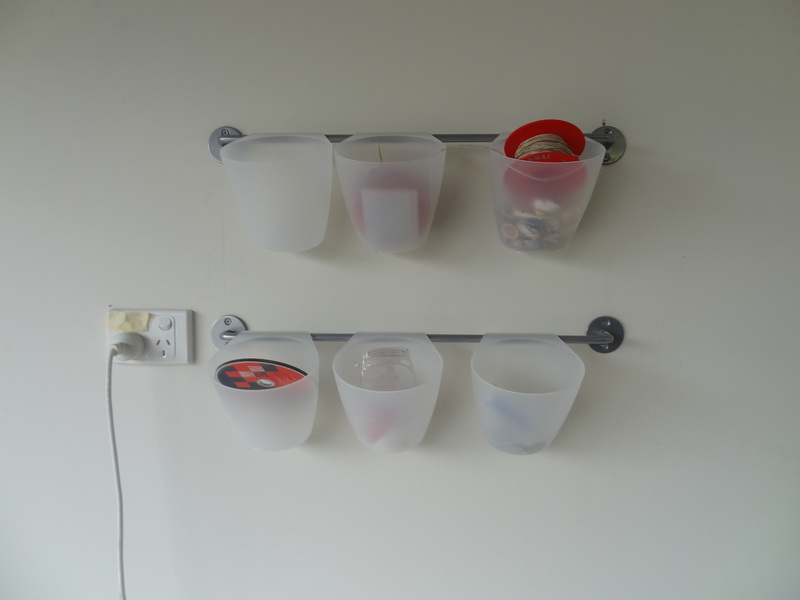 To see some of the other ideas we have implemented to contain our ‘stuff’, have a look here and here. 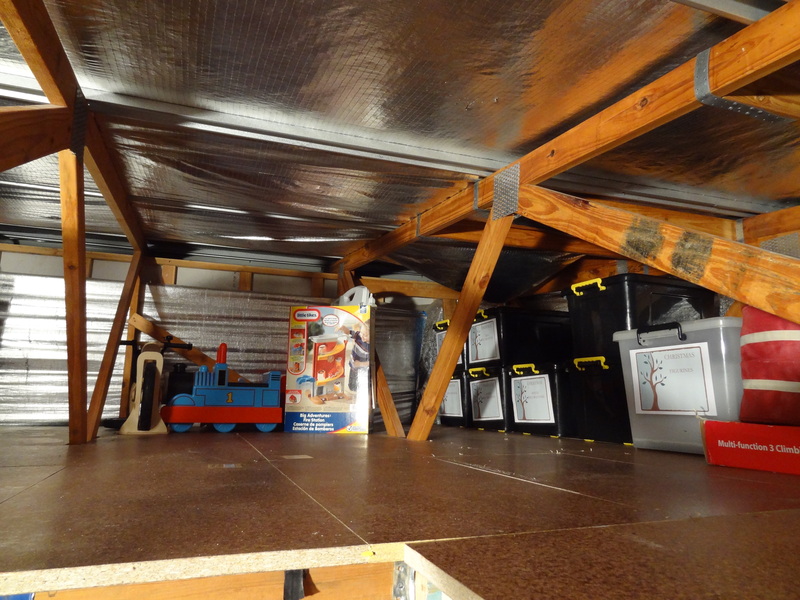 Today, I thought I would show you the best storage solution we have ever implemented – the conversion of some of our roof space into a storage area. 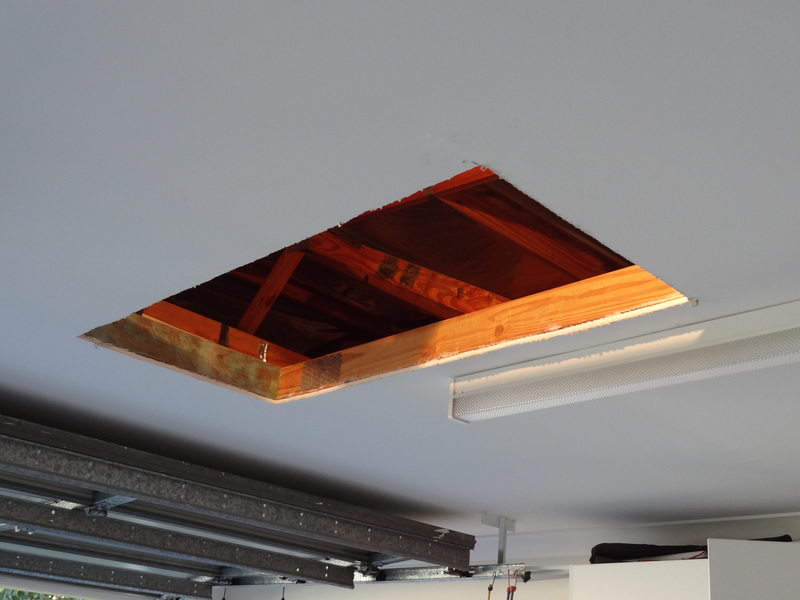 In Australia it is very uncommon to find roof space converted into an attic or storage space. I think the main reason for this is the climate. It is just too hot up there to store most things. It is becoming more popular as people realise that the wasted space could so easily be earning its keep! We have always stored in the roof space above our garage our seasonal decorations, especially our substantial collection of Christmas lights and decorations. However poor hubby would have to squeeze through the manhole in the ceiling, tiptoe along the beams in the roof to grab the boxes perched precariously around the space. We had long considered converting the space, but I baulked at paying a specialist well over $2000 to store some boxes in more comfortable surrounds. 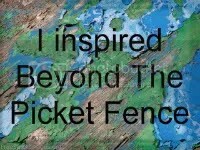 Hubby, never letting go of the idea, researched long and hard the options and talked with our builder. Finding a ladder from an import company at a fraction of the price you could get them elsewhere, he lined up the builder and the project began. Following the instructions that came with the ladder, the boys cut a hole in the roof and attached the slide down ladder (which incorporated the ceiling door) in no time at all. We chose an area in the ceiling sitting to the side of where we park the car so that the roof space can be accessible at all times. 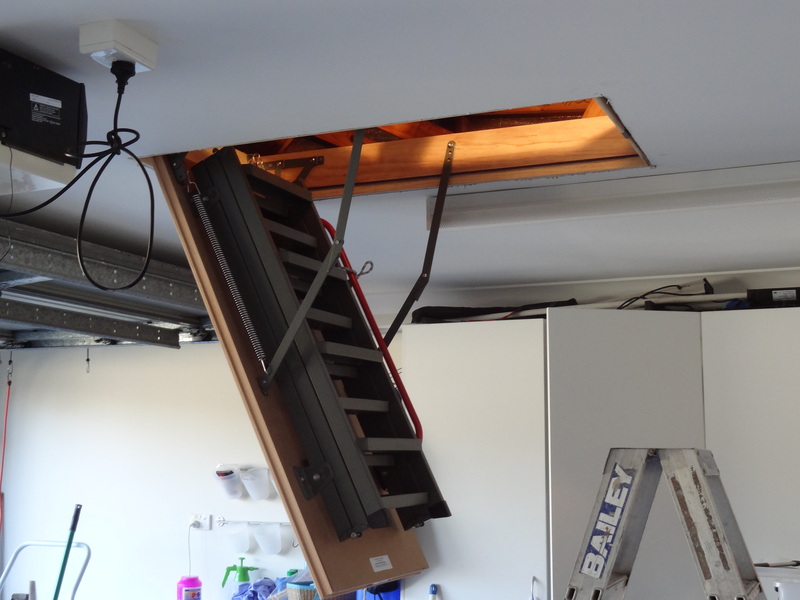 The builder then laid flooring across half of our roof space above our garage. We chose only to do half as you can see we have barely filled the space we have created. We can always add more flooring if the need arises. 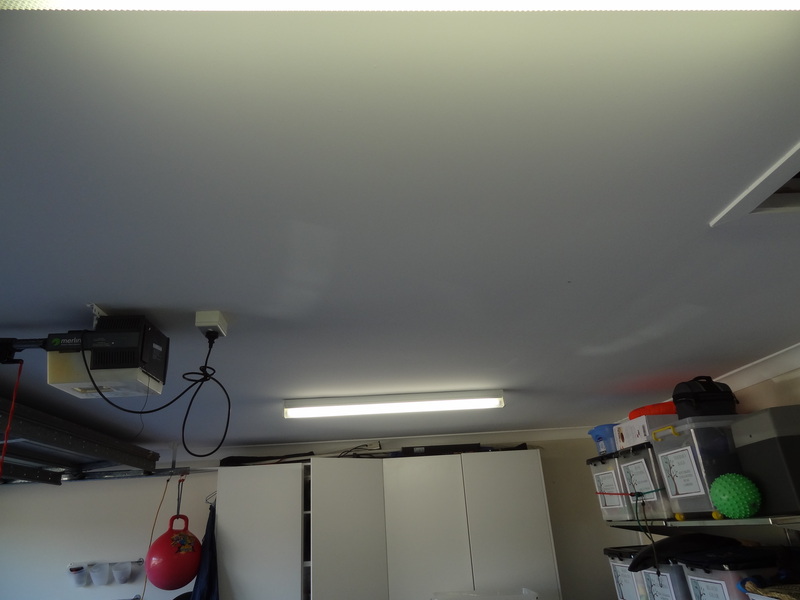 We got our electrician to install a power point and light so we can see all that is hidden up there. Now store all our decorations, christmas lights and camping gear in the space. It has also become a good hiding spot for birthday and christmas presents that I buy ahead of time. We bought new black, heavy-duty plastic storers to hold a good deal of our items. They are less brittle than the regular boxes that can deteriorate under the high temperatures in the roof during the Australian summer. When we moved into our house, the garage was just a big empty room. There was no storage at all. 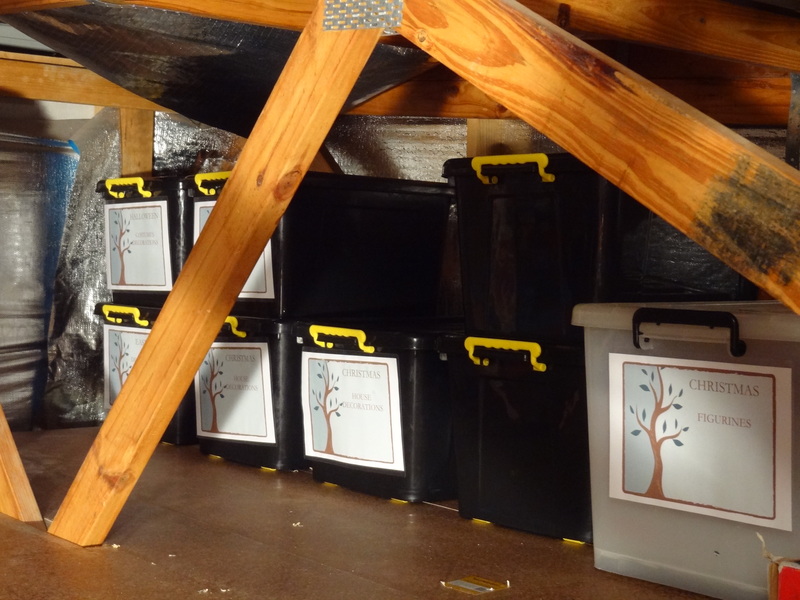 As our family has grown and we have accumulated more ‘stuff’ , we have had to create a place to store it in our garage. 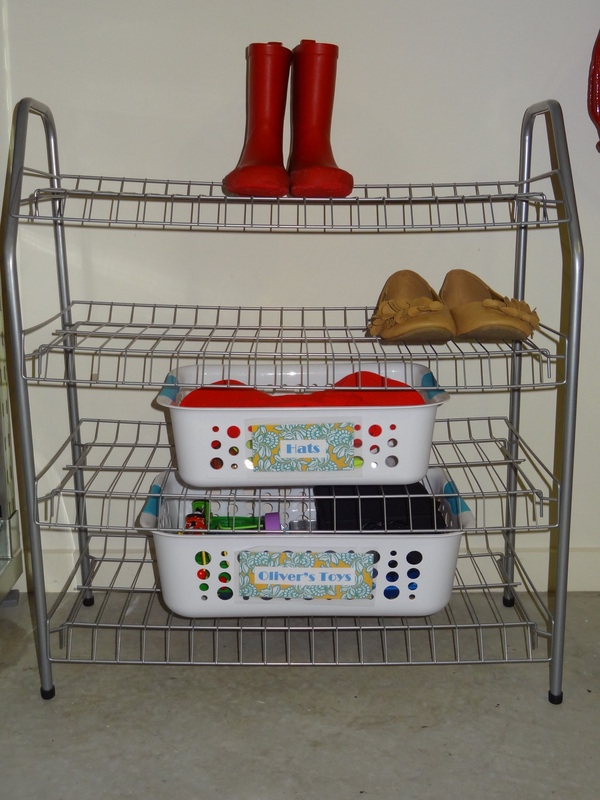 Yesterday, I wrote about the Ikea Broder units we purchased to hold the large plastic containers we use to store kids’ and partyware items. Today I thought I would show you the built-in storage we installed for storing more typical ‘garage-y’ items like tools and paint. We got our cabinet-maker to install two full-sized, double-doored cupboards and one shorter, double-doored cupboard. The smaller cupboard is where we store our paints and chemicals. The top of the cupboard provides a much needed bench for those time where you are trying to mix paints, sort hardware etc. Above the bench we have hung some Bygel rails and containers from Ikea to hold bit and bobs. The first larger cupboard holds the tools and hardware we own. Not being huge DIY-ers means that there is more than enough space for other things like a picnic basket, pump for the water tank and some sporting equipment. The second cupboard is mostly mine. It chock full of teaching resources, all our receipts, manuals and momentos from our wedding and travels. Before today, and taking these photos, I probably would have said these cupboard were pretty neat and tidy. 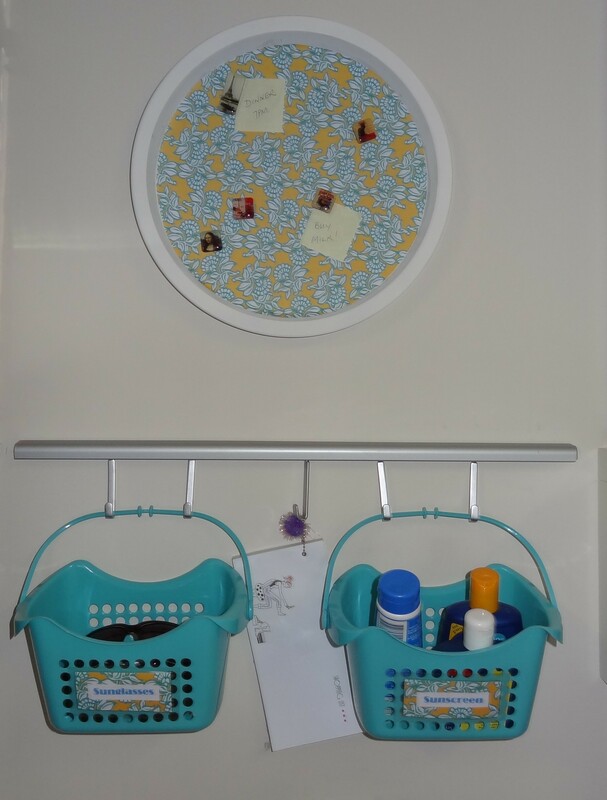 However, the more I look at the pictures here I can see they could use a little organisational magic. 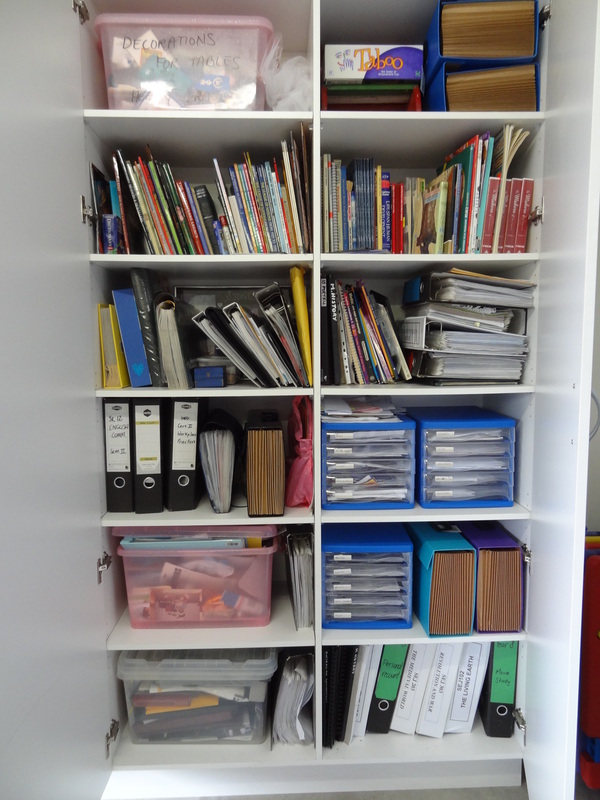 So as I sit here typing, my fingers are itching to cull, straighten, group and sort all that is in those cupboards. Am I the only one who gets like that? 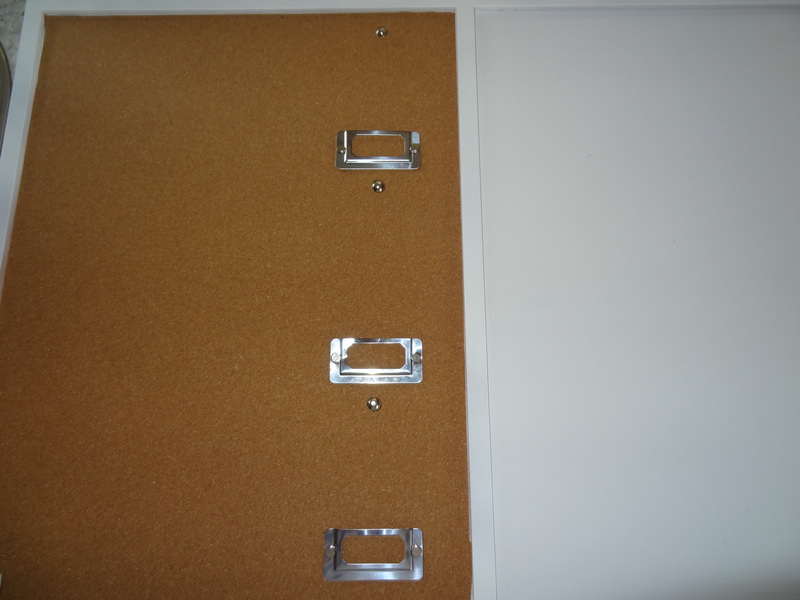 The weekend is coming and organising these cupboards is on my must do list. Hopefully before the weekend is out, I can show you an improvement here. The only thing I dread about organising this space – I know it is going to get a whole lot messier before it gets neater. We have been on a mission in the Crooked Household to improve storage. The first place we have started is in the garage. 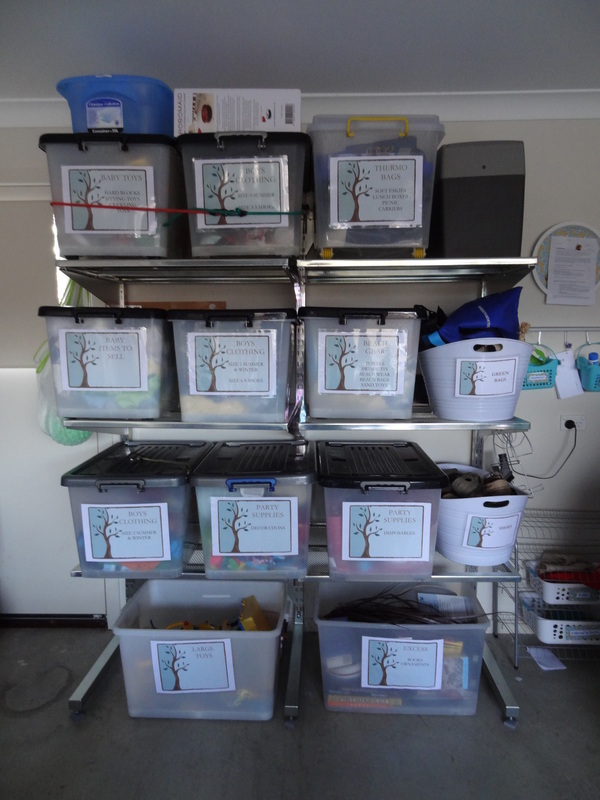 So this week I thought I would show you some of the little projects we have undertaken to organise our garage. 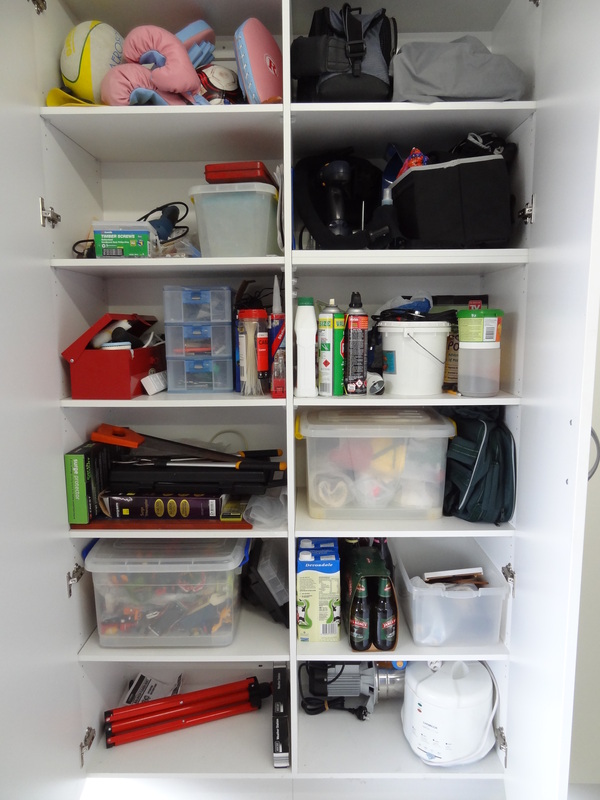 I warn you – any posts on garage organisation in our house will not be filled with pretty pictures. 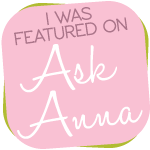 I would never strive to have an immaculate garage – it just doesn’t work! But if you can see past the ugly concrete floor and mismatched boxes, you might find an idea that helps you in your garage. 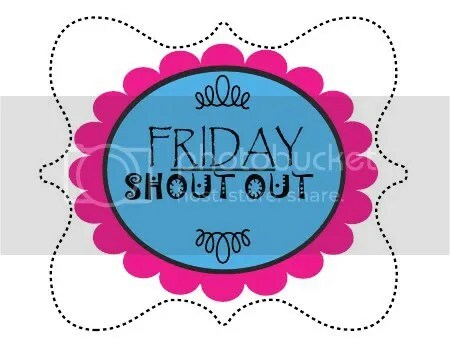 And if you have any tips for me I would love to hear them. We have always tried to keep the garage reasonably neat and organised. We somewhat effectively employed large plastic boxes to group and store items in the garage. They looked relatively neat stacked on top of one another, but what a pain it was to retrieve something from a box lower down in the stack. Sick of doing the shuffle of boxes, I looked for new storage solutions. I investigated all manner of systems – shelves, tracks, walls, baskets, cupboards. Not only was it a logistical nightmare to design and erect something to fit everything in, it was looking at being expensive. Nothing seemed to offer the amount of storage the boxes did in the limited wall space we had to play with. I couldn’t really ignore the fact that the plastic storage boxes were not only inexpensive but were a lot hardier than a lot of the solutions I was looking at. I liked being able to group like items together in the boxes and by being able to secure their lids tightly, meant dust was kept at bay. Almost at the point of giving up, and resigned to having to put up with the box shuffle, I found our solution at Ikea. 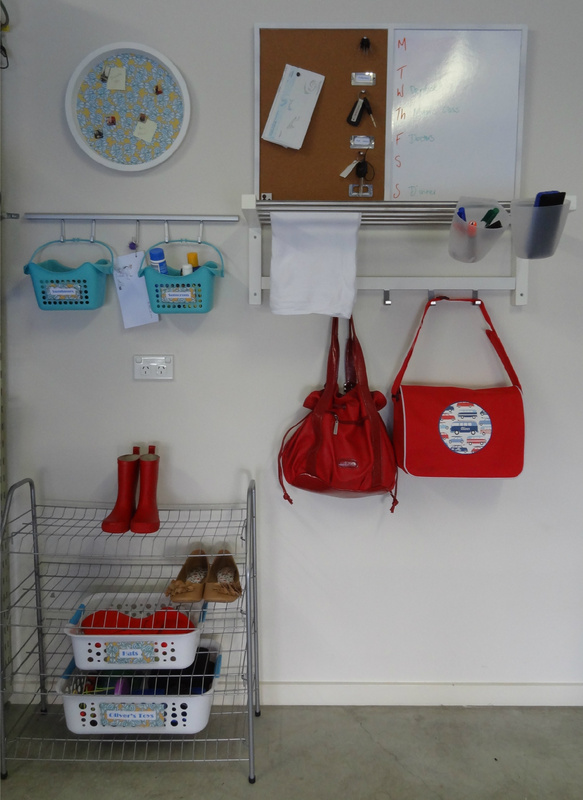 The Broder system is perfect for garage organisation. 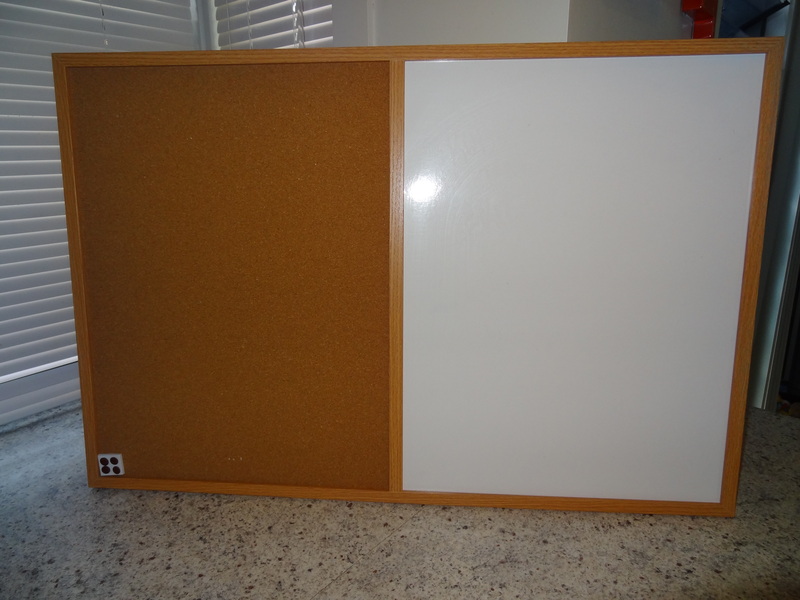 You can choose the type of base you want – wall-mounted, free-standing double-sided or free-standing single sided. To that you add your shelves that come in a variety of widths and depths. The whole unit, including the shelves are made out of galvanised steel so they are very sturdy and hold a good deal of weight. 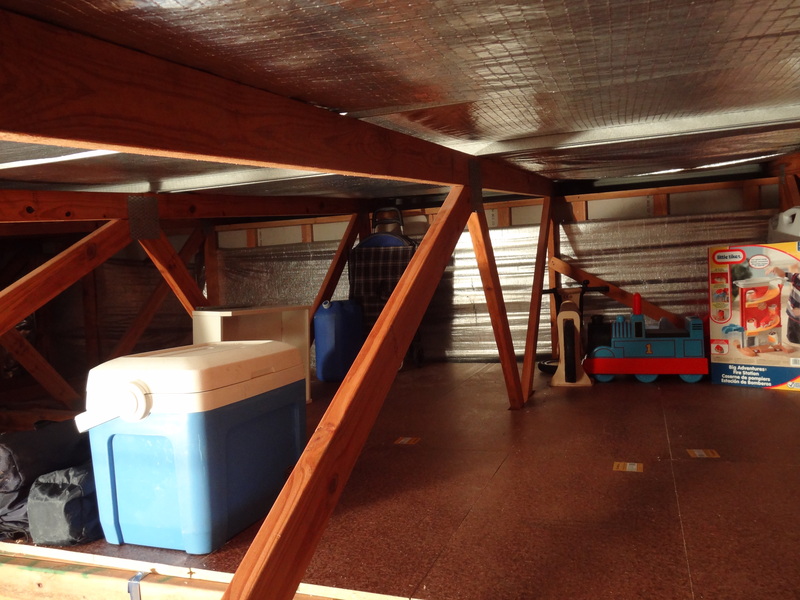 The shelves can also be used outdoors, perfect if you instead have a carport that might allow rain in at times. 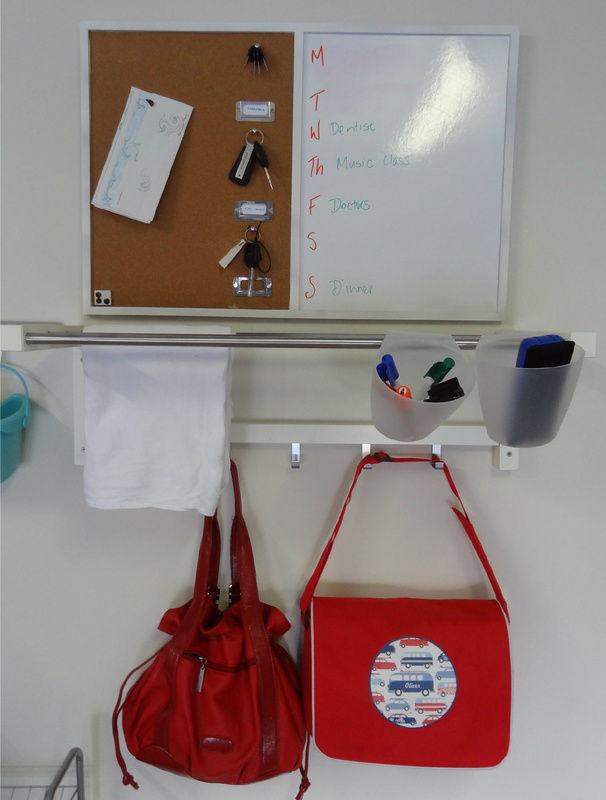 We chose the single-sided, free-standing system with the largest shelves for our garage. We really like it. With this system we can hold our large plastic storage containers in a manner that allows us to access inside all the time. They were quite easy to put together and anchor to the wall for safety. By keeping the plastic storage containers and buying the Broder shelving units, we were able to store more ‘stuff’ in a smaller space. It wasn’t cheap but we can see that it will last. Most importantly it is flexible. We will be able to add and subtract from what we have easily to suit our needs. If for some reason we no longer need the shelves, as they are not wall mounted, we can easily move them to another location or sell.